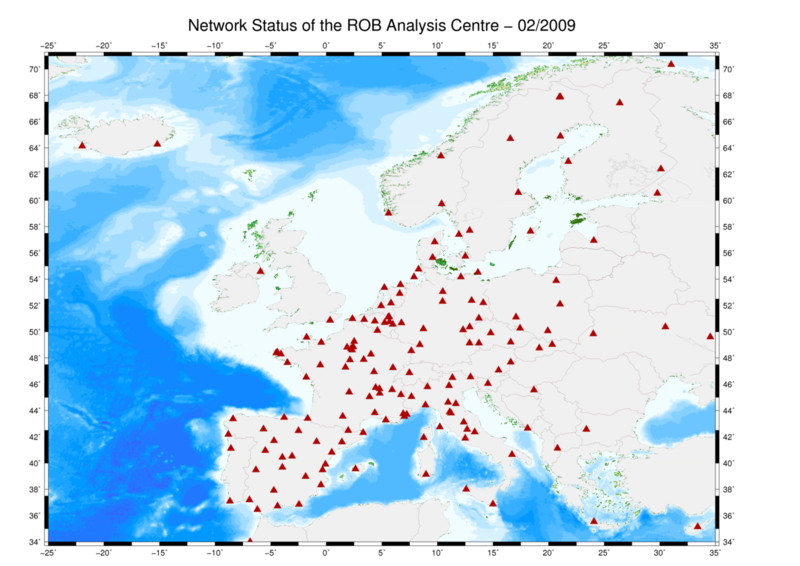 As an E-GVAP analysis centre, the Royal Observatory of Belgium (ROB) provides near real-time (NRT) ZPD estimates for a regional network of GNSS stations covering the whole of Europe (Figure). The network contains at the moment about 160 stations: most of them belong to the EUREF Permanent Network (EPN, [Bruyninx, 2004]) and to the International GNSS Service (IGS, [Dow et al, 2005]) network. This research is carried out in the frame of the Solar-Terrestrial Centre of Excellence (STCE) which is a project funded by the Belgian Federal Science Policy. Within E-GVAP, the expert team on GNSS data processing decided to not constrain the participating analysis centres to use a specific software nor to follow any guidelines: it is the responsibility of each analysis centre to determine the proper processing options for meeting the E-GVAP requirements. 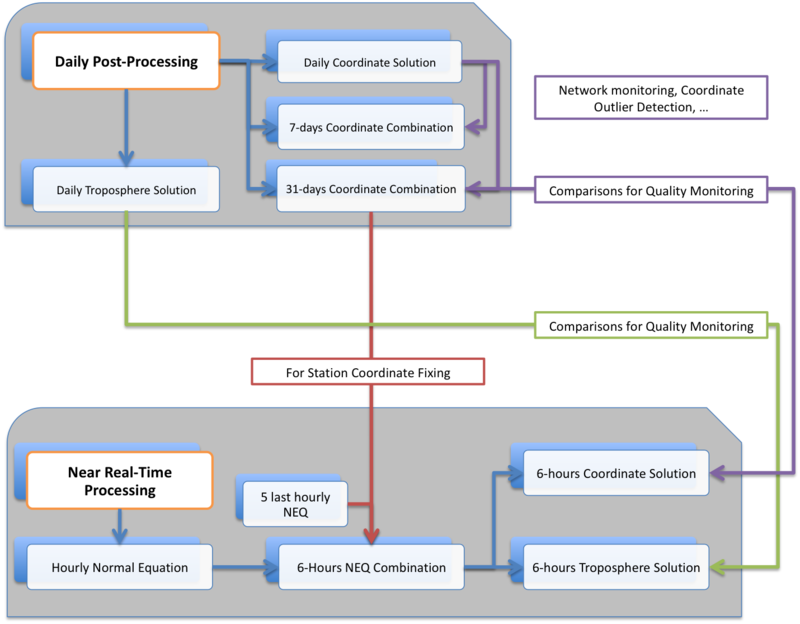 To reach this goal, ROB has setup a 2-step GNSS analysis methodology. The strategy is based on ionosphere-free GPS carrier-phase double difference measurements in a network approach and is performed using the BERNESE software version 5.0 [Dach et al., 2007]. The global structure of the ROB processing methodology is presented in Figure . A complete description of the strategy can be found in [Pottiaux, 2008]. 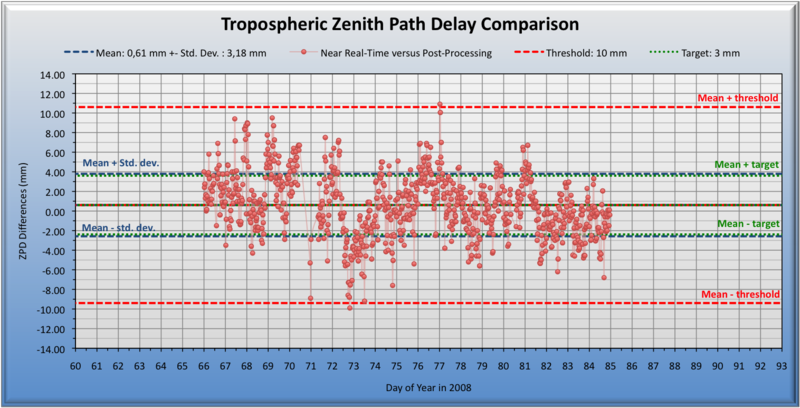 The main product of this project is the near real-time tropospheric Zenith Path Delay time series for each GNSS station within the network. 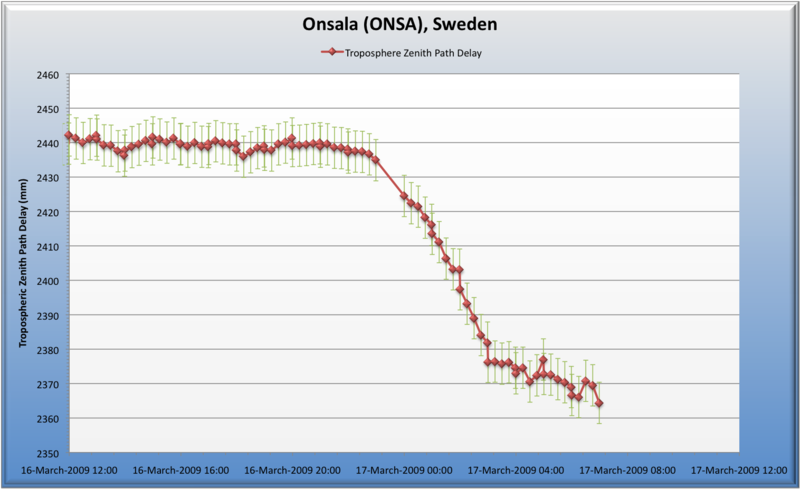 The Figure below illustrates the ZPD time series for the station Onsala (ONSA) in Sweden. Another product is the tropospheric ZPD grids over Europe. A robust Quality Monitoring Scheme (QMS) was setup at ROB to monitor permanently the production and the quality of the NRT ZPD estimates. The QMS monitors the ROB analysis centre performance every hour and covers at the moment the main aspects of the E-GVAP user requirements: the repetition cycle, the spatial resolution, the timeliness, the precision and the absolute accuracy of the solution. The global structure of the QMS is illustrated in Table . Based on this QMS we assessed the ROB analysis centre performance. 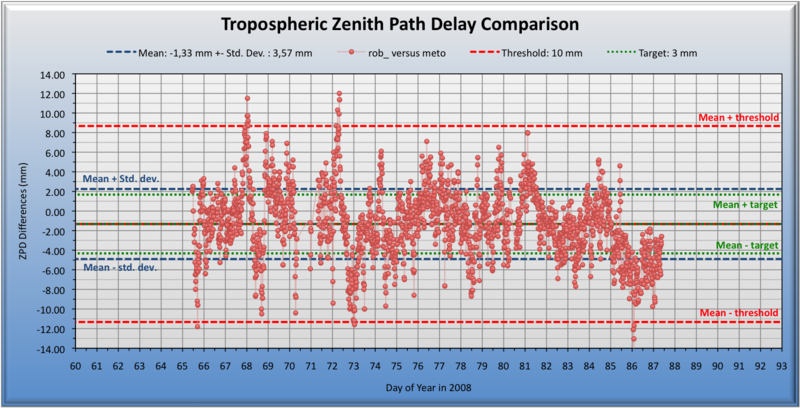 Figure and Figure illustrates the assessment of the troposphere Zenith Path delay precision. Within E-GVAP, the spatial resolution of the GNSS regional networks processed by the geodetic community allows to detect only large mesoscale patterns in the tropospheric refractivity field [Pottiaux, 2008]. 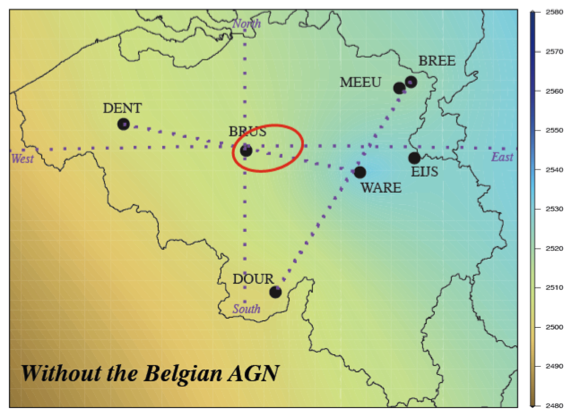 The Belgian GNSS densification network is used to investigate the detection of smaller mesoscale (meso-beta and meso-gamma) structures in the troposphere.